Headphones in general are so useful in our day to day life. We may not notice it at first, but if you would be able to take some moment and realize the little things that we do using it, you will be grateful that these devices were invented. There are so many things that headphones are used and it is not limited to listening music to your gadget or phone. In this article we would talk more about it and also this will help you to decide if what kind of headphone is perfect for you to use. What are Noise Isolating Headphones? As what have mentioned earlier that there are different kinds of headphones that are being sold in the market, but the one that I will be talking about is the Noise Isolating Headphones. If you have time to check, there are a lot of noise isolating headphones that are being sold in the malls, all of them are saying that these are the best noise isolating headphones now in the marker, but what does it really take to be considered as the best in ear noise isolating headphones to which we will discuss it right now. For me, to be considered the best it should go beyond the standard of the product and it performs outstanding performance when it comes to their use. It should also have the quality at the same time it does not necessarily mean that it should be expensive. There are two different types of noise isolating headphones and these are the over ears headphones and the in ear headphones, both are have the same use and functionality the only difference there is the method that is being used by the user. When we say over ears headphones, it talks about headphones that are placed over the ears just like how girls place their headbands. This type of noise isolating headphones is commonly used by those who are in a shooting range or in helicopter rides. This type is bulky and is used mostly by heavy duty purposes. While the in ear headphones are mostly resembles as ear plugs. This type is commonly used during swimming or when you have a long airplane ride to prevent ears from popping due to gravity. 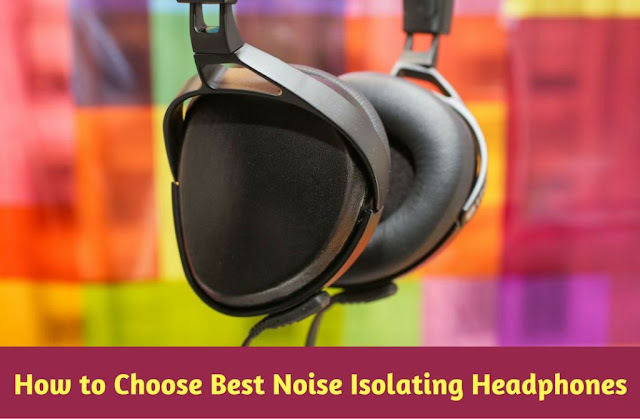 The pros of using noise isolating headphones is that this will save and protect your ears from too much noise pollution since this will have an effect on your hearing in the near future. When you encounter a noise pollution for example when you ride a helicopter, most of it are pretty noisy and sometimes you cannot endure the travel because of the noise. Or during shooting practices where in you are not so used to the firing sound when you try to fire a gun. There are people who doesn’t like that sound since it gives them an after ringing sound in their ears and it doesn’t go away that easily. The only cons of noise isolating headphones is that it is not convenient and we don’t carry it all the time since it is bulky and we sometimes don’t need it to carry around us all the time. Noise Isolating headphones are so easy to use and it doesn’t need some special equipment and procedure to use it, all you have to do is simply put it over or in your ears and you are definitely good to go with it. Just be careful to be more vigilant to your surroundings and make sure that you are in a safe place. Since this special equipment gives you a minimal to absolute zero sounds, you are not that aware of what is happening around you since all you have is the sense of sight, so if you are planning to walk in the streets using a noise isolating headphone, then the best possible thing to do is to remove it so that you will be away from any forms of danger or harm. Make sure that if you are planning to purchase a headphone, you have to consider its functionality over style since that should be given outmost priority. Also make sure that it is still in good condition and don’t ever pay for those products that has a factory defect since we don’t want to waste our money just because we fail to check it and it is a total waste of time to call it over a customer service provider.